Los Angeles, CA – Revered Bay Area pop-punk band The Story So Far has announced plans for a spring headlining U.S. tour. The excursion will include support from Four Year Strong, Terror and Souvenirs and kicks off on May 1st in Santa Ana and will culminate on June 13th in San Francisco. 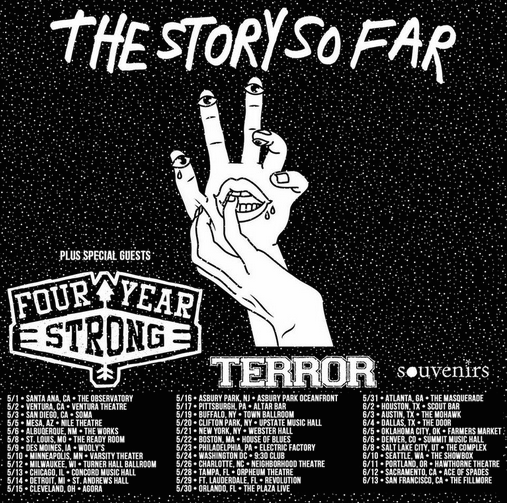 VIP Tickets/Packages are on sale now at http://www.showstubs.com/tssf and general tickets go on sale Friday, February 27th at 12:00PM local time. VIP packages will include a general admission ticket, an exclusive shirt, a download of forthcoming album and a poster. The Story So Far are currently finishing up work on their third studio record, which they’ll be supporting on the upcoming tour. Details about the record will be announced soon. Over the past two years, The Story So Far has quickly become one of pop-punk’s most buzzed about bands with the release of their sophomore album, What You Don’t See, and an acoustic EP, Songs Of, which are available now from Pure Noise Records at http://purenoise.merchnow.com/catalogs/The-Story-So-Far. Follow The Story So Far at https://www.facebook.com/thestorysofarca for news and updates.